Fertiliser N responses have been large and consistent for short fallow crops, whilst long fallowing reduces the size and frequency of N response. 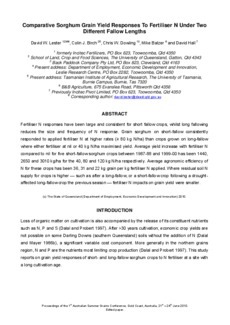 Grain sorghum on short-fallow consistently responded to applied fertiliser N at higher rates (≥ 80 kg N/ha) than crops grown on long-fallow where either fertiliser at nil or 40 kg N/ha maximised yield. Average yield increase with fertiliser N compared to nil for five short-fallow sorghum crops between 1987-88 and 1999-00 has been 1440, 2650 and 3010 kg/ha for the 40, 80 and 120 kg N/ha respectively. Average agronomic efficiency of N for these crops has been 36, 31 and 22 kg grain per kg fertiliser N applied. Where residual soil N supply for crops is higher — such as after a long-fallow, or a short-fallow crop following a drought-affected long-fallow crop the previous season — fertiliser N impacts on grain yield were smaller.